LUS Fiber now offers its business subscribers the current ultimate in broadband speeds. 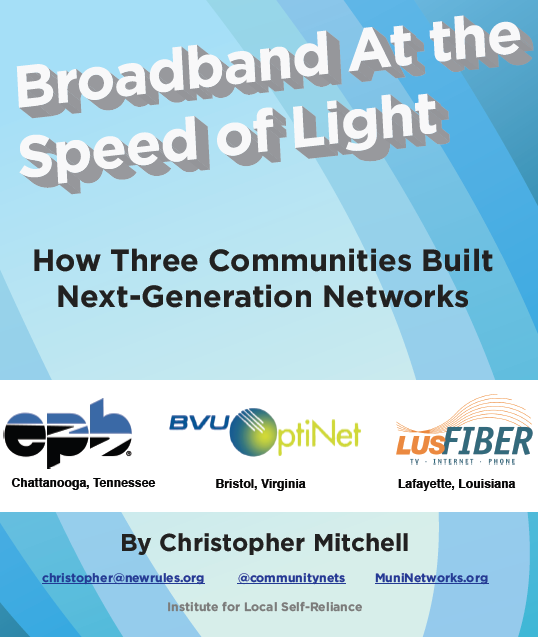 An April 5th press release from LUS Fiber reports that business customers of the state's only community-owned ftth network now have access to 1 gig symmetrical internet connections. We have reported extensively on events surrounding the development of, and contiued corporate attack on, the LUS Fiber system. The local Lafayette Pro Fiber Blog reporter, John, notes how this advancement is rare in the US because the LUS 1 gig service can be offered to all business customers, not just those considered part of a "business core." Oversubscription and "best effort" is the name of the game for almost all ISPs and the bandwidth available to the last mile customer is in practice limited: if all subscribers were to use their full bandwidth at once the available speed would drop to a small fraction of the promised bandwidth. LUS has always played that game a different way, minimizing oversubscription and ensuring that even during busy hours of the day the customer's full bandwidth is available. That's in marked contrast to what I used to experience on Cox when the kids in my neighborhood got off the bus. Logan McDaniel, whose LPSS (Louisiana Parish School System) has been on the wholesale network since 2005, reported that they'd already upgraded the central office to two gigs and some of the high schools to a gig. The new plan that superintendent Cooper unveiled last night included an increased use of distance learning. But the most interesting testimonial came from Dr. Menard of St. Thomas More, who noted that her school's technology initiative had placed an internet-connected device in the hands of every student, complained that they were already hitting the limit of a 100 meg connection and were eager to be the first customers of the new 1 gig service. Congrats to LUS Fiber and its proud owners - the community - on the new capabilities of their network!